Our mission is to engage a diverse pool of postdoctoral fellows at the University of Washington and affiliate institutions in a closely mentored apprenticeship to learn how to teach scientifically with inclusive, demonstrably effective, student-centered pedagogies. This apprenticeship provides teaching experiences for postdocs who have 100% research appointments. Postdocs attend short training sessions that efficiently introduce state-of-the-art teaching strategies that are effective for students and time-saving for instructors. The postdocs work in teams of three to co-design and co-teach their courses. Each team delivers a 10-week, special topics seminar course. 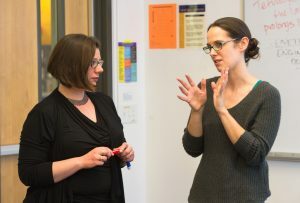 The program directors observe class meetings and meet regularly with the postdocs to discuss the strengths of their teaching and to brainstorm on strategies to addressing areas that need improvement. Some of the seminars target biology majors, and are held at either UW Bothell or UW Seattle; other seminars are for nonmajors at UW Bothell. All of the postdocs come together at the end of the academic year to share experiences and improve their teaching philosophies and dossiers.These program features allow the postdocs to set and meet reasonable training and teaching goals without disrupting their research progress. Since 2011, over 120 postdocs from different UW departments and affiliate institutions have participated in this teaching apprenticeship. The postdocs design and teach innovative seminar courses for undergraduates at UW Bothell, UW Seattle, and University of Puget Sound. These seminars enrich our undergraduate curricula and provide opportunities for students to learn about cutting edge research and to benefit from highly interactive discussions with their instructors and peers. Please direct questions to Dr. Becca Price, the Executive Director of STEP.